Usually my favourite kind of beer is free or cheap, so you can imagine how stoked I was to discover some very good beer – ParrotDog’s Bloodhound Red Ale – going cheap at Wine Direct in Parnell, Auckland. The only caveat? The beer was six months or so past its best-before date. But that didn’t faze me, of course. Cheap is cheap, and beer is usually good well past its best before date in my experience. However, in the interests of balance and fairness it’s worth keeping that fact in mind as you read this review. Blurb on the bottle: A grassy NZ-hopped aroma featuring a hint of roasted malt is supported by a full-bodied, red-coloured malt base and a pleasant NZ-hopped bitterness to round off. Parrot Dog Brewery: ParrotDog began with a manic Indian Ringneck parrot and two dogs. These ‘dogs’ were Matt and Matt, two students with a passion for craft beer who began home-brewing under the watchful eye of Schmee the parrot. Smuggling flagons of home-brewed beer into local beer events produced some surprising feedback from ‘real’ brewers, which quickly gave Matt and Matt the confidence to go commercial. Long story short, they’ve since moved the beer making out of their Aro Valley flat and into their own brewery in the heart of Wellington city. Tastes like: If the ravages of time have done something to ruin the taste of this beer, then I really should rush out and grab me a six-pack pronto, because ParrotDog’s Bloodhound Red Ale is a sensational beer. It’s more like a highly refined, extremely well-balanced IPA or a solid pale ale, with a big hop taste and aroma. And yet it’s as smooth as a ladies’ man covered in Vaseline, full bodied, and boasts a delectable toffee/caramel sweetness that’s hard to resist. This red ale is an honest-to-goodness crowd pleaser; I sure wish I bought more than just the one bottle. 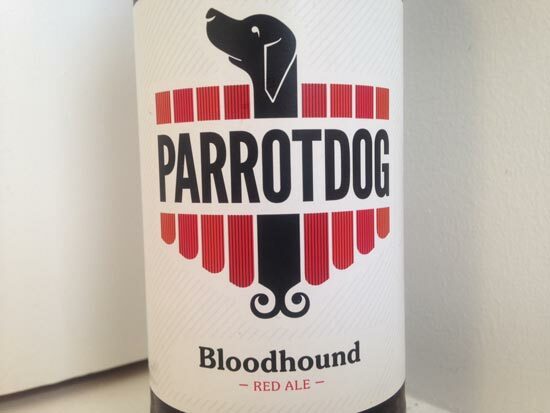 According to the ParrotDog website, Bloodhound won a silver medal at the 2015 Australian International Beer Awards, which is frankly crazy. This beer is pure gold, baby. Movie/beer pairing: A great beer like this one deserves a great film to complement it – and because it’s called ‘Bloodhound’ I tried to think of a movie with bloodhounds actually in it. Thus you should pop the cap on a bottle of ParrotDog’s Bloodhound Red Ale and watch Paul Newman absolutely knock it out of the park in Cool Hand Luke, one of my all-time favourite movies. I’m sure you’ll love ‘em both.